Our client is a well-known group of physicians based out of Avon, Indianapolis. The client approached Outsource2india for processing 3000 encounters for a group of physicians tied from a rehabilitation care. We were elected for the project because our company had the expertise and experience to operate EHR software for streamlining billing and revenue generation. The client furnished the login credentials and technical assistant to demonstrate the overview of the software. 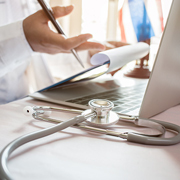 The client faced difficulty with EHR challenges, the accuracy of transcription for revenue management, transfer of audio files from remote locations. Also, since clinic visits were at varying intervals for each physician, it was challenging to make sure that all physician encounters were dispatched in time. With rich experience in the management of rehab files, we, at O2I, developed a high-quality flowchart to make the EHR legible. We assigned a dedicated team to interact and gather data from physicians by phone calls and email. We could efficiently understand the mechanism of the EHR software thanks to the assistant sent by the client to show us the software overview. After acquiring adequate information, we optimized all encounters and positioned transcriptions in the format suitable for the software. From there, the software would obtain a physician's signature before automating the process. Being an ISO certified company with 20 years of solid industry exposure, we have been a leading provider of medical transcription services. Our team size peaks over 200 with transcription and insurance experts who possess 10+ years of experience in this niche service. We have handled over 50 projects and helped clients from many parts of the world. Our global offices span across three continents and equipped with state-of-the-art infrastructure. We also cater to all your needs remotely if you are from a different time-zone. Get round-the-clock support at a fraction of the cost to make great savings. Save more than 50% of your spending by outsourcing medical transcription services to us. Get in touch with our team to partner with the best service provider.